During our research on Failaka the experiments were included in the activities when the necessity of better understanding of use of different materials as well as of characteristics of environmental conditions turned out to be inevitable for interpretation of the finds. Up-to-now, experimental activities concerned following fields: geophysics, pottery, bitumen and environmental studies. To understand the results of geophysics, the experimental measurements were carried out when known objects were buried in known depths, then measured and obtained data were analysed. 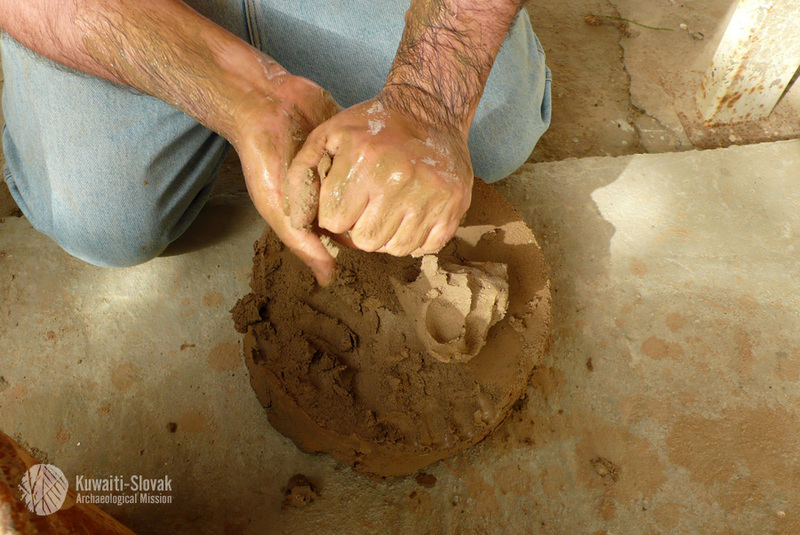 To understand dealing with clay and pottery, it is important to know whether pottery was produced locally or not. If yes, the local source of clay, knowledge of pottery kiln construction (reflected by archaeological finds) and available local source of the fuel for pottery burning is inevitable condition of such activity. If not, the places of origin of pottery from archaeological sites of interest as well as possible ways of transportation have to be recognized. 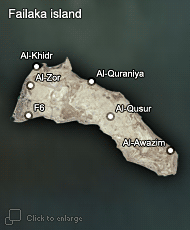 There are remains from the sites on Failaka (F3) interpreted as kilns by archaeologists. To be able to prove local pottery production, KSAM started survey for possible local sources of clay available on the island. According to the information by the original local inhabitants of Failaka, the survey was started at Al-Zor/Mathina site situated by the eastern edge of Al-Zor village. Mathina is one of the lowest points of Failaka, recognizable as depression in the terrain even by bare eye. Six test soundings were excavated here that were sampled for clay. Apart from those, other possible natural formations (pits, depessions) with seemingly suitable clay material were sampled. All clay samples were processed in the house and used for making experimental bricks that were numbered according to the sample registration code and burnt in experimental fire place. This first step was supposed to prove that local clay was suitable for production of objects that can be further processed in the fire. Therefore at this stage, only wood from local garbage areas (i.e. not fuel source accessible in the past) was used that is, in futher steps, to be substituted by local fuel sources possibly available during the Bronze Age. Bitumen was widely used on Al-Khidr in the Bronze Age as it is evidenced by the finds from Al-Khidr site. To understand the ways of dealing with this matter, experiments were employed to investigate the ways of raw bitumen preparation and the processes happening by heating the bitumen and by plastering other matters with bitumen. At this stage of research, bitumen nowadays available at the local markets in Kuwait City was used. For the future, experiments with raw bitumen from Kuwaiti local oil sources are supposed to take place.